Call 239-284-1482 to schedule your first appointment. You can join the growing number of customers who have turned to America’s most trusted source for hearing aids and hearing services with a visit to Miracle-Ear®. We serve customers in Bonita Springs and Naples as well as nationwide. Our experienced hearing care specialists will start with a hearing test to measure your level of hearing loss. If we determine that your hearing could be improved with the use of an aid, we’ll show you a variety of hearing aids including those with GENIUS™ Technology. This new technology incorporates the latest methods for improving hearing, focusing on the sound of the human voice, and blocking out wind and background noises. You have been exposed to loud noises over a long period. You avoid social engagements because of discomfort caused by your hearing inability. In addition to technology improvements, hearing aids have improved in appearance. In recent years, hearing aids have been developed that are not only more effective with hearing assistance; they've also become more discreet. Aids have become smaller, allowing them to be fitted deeper into the ear. They're also available in a spectrum of skin tones, so many people you interact with will not even be aware that you're wearing a hearing aid. Discover and experience the Miracle-Ear advantage. Our brand has over 1300 locations nationwide. When you’re shopping for hearing aids in Bonita Springs, FL, visit our Miracle-Ear location. You can come in for a free hearing test. * You have nothing to lose because we offer a 30 day risk-free trial. ** Stop in and relearn the joys of hearing the calls of wild birds, understanding conversations, and following your favorite television shows. Veronica Johnson has lived in Naples for 5 years. Prior to relocating to Florida she worked as an office manager in Lansing, Illinois. Veronica enjoys music, dancing, reading and computers. She and her husband Ron have 3 daughters, 9 grandchildren and 9 great-grandchildren. Veronica joined our Miracle Ear family this year. Her quote – I love my hearing aids, I couldn’t go without them. It is so refreshing not to have to ask people to repeat, it’s fabulous to hear clearly again. Judy has been wonderful to work with, very patient and understanding of my needs. Come meet Judy Spina, born in a small town in the Finger Lakes, Geneva, New York. Judy received her Bachelor of Science degree from Buffalo State College and moved to Florida in 1999. Judy is thrilled to be serving the hearing health needs of the Southwest Florida community and particularly enjoys helping to improve patient's quality of life and communication with loved ones using technology of the highest standards. Over the past 10 years, Judy has strived for excellence in patient care and counseling. She is an active member of the Florida Society of Hearing Healthcare Professionals as well as the International Hearing Society. In her spare time, Judy enjoys biking, kayaking, spending time with family and exploring new places in her Winnebago Rialta RV. I am very happy with my service everyone was pleasant and helpful! These people are great. Very caring ad concerned about your ear health! I have had three previous top of the line hearing aids from other providers and all experiences were negative. Then I found Miracle Ear and Judy Spina. Thankfully since finding Miracle-Ear Bonita Springs, my present experience with has been clearly the best. These hearing aids are the best I've used in my 30 plus years of wearing hearing aids. The power and adjustability for different locations and hearing situations is a real plus for me. In addition, having an app that allows me to check battery strength, adjust listening environments and make choices for strength of signals makes the aids easy and fun to use. I need to wear them more to enjoy all there is to hear around me! I recently purchased the newest, latest Genius 3.0 hearing aids. My voice, as well as others is so natural I could almost forge I'm wearing he hearing aids. After several visits to Judy in Bonita, everything is working great. Her patience and expertise are beyond my expectations. Having read the manual, I went in with a list of questions, and each one was addressed and answered to my satisfaction. 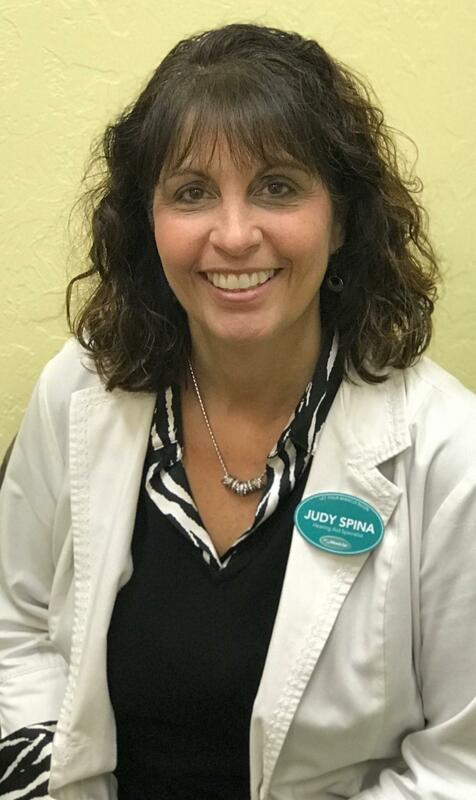 I would highly recommend the product and Judy Spina! Wonderful, helpful,explains all functions and very willing to help with all problems. Judy is the best and its a very friendly atmosphere! I was so pleased with my experience that I put your business card on the bullentuine board in my community. Judy's service to me has been outstanding. My past experience with other providers has been sub-standard. These people are great. Very caring and concerned about your ear health! I feel that my experience with audiologist Judy Spina has been very special compared to my 15 years with my previous audiologist. After visiting and doing business with 3 other hearing aid people. I have finally found a product that performs. The simple change that was made to the sleeve that helps it stay put in the ear as appose to around the ear. I dont know why others have not used this new design before this? These people know what they are doing! I was so pleased with my experience that I put your business card on the bulletin board in my community! Wonderful, helpful and explains all functionalities. Very willing to help with all problems. Judy is the BEST and they have a very friendly atmosphere. Great Service - plus, plus! Nancy and Taylor worked hard on my hearing problem. I purchased my hearing aids on December 1st and so far my hearing has improved 100%. Thanks to Mike Warren I will not be left out of conversations this holiday season. Thank you! To be completely honest, I really don't remember what, or who, sent me to Miracle-Ear Bonita Springs but I do know I would not have been expecting a "Miracle", but some way, somehow it happened! I honestly believe the people at Miracle-Ear were mainly concerned (and continue to be) with how much they can help my hearing problem, and not with how many dollars they can make off my hearing problem. I would describe it as wonderful. The staff are really caring. They really want to work to help you hear to your full potential! Once I began wearing Miracle-Ear hearing aids I immediately realized how much my hearing had deteriorated. Thanks Miracle-Ear for giving me back one of the greatest gifts in life -hearing!